Video displays offer a host of new opportunities for facilities to shake things up. Very commonly a single venue will host multiple sports, whether indoor or outdoor. Static scoring is a simple, affordable option when only one sport is played, but if your teams share one sporting field or court what’s a solution to show scoring for all? A video display. When it’s time for Friday Night Lights, fire up you video board, and get ready to run some instant replays. See a few different content options Carl Junction uses for game night. Have a basketball game Friday night and a volleyball tournament at 8 the next morning in the same gym? Highlight your student athletes with a headshot or show previous game statistics. How about a customized team spirit graphic to get the crowd fired up? With so many capabilities, how do operators keep things straight for each sport? That’s probably the best feature of all. LOG IN. SELECT SPORT. DONE. Once set up is complete and game day is here, simply log in like usual and select the sporting event to occur. (It’s seriously that simple.) 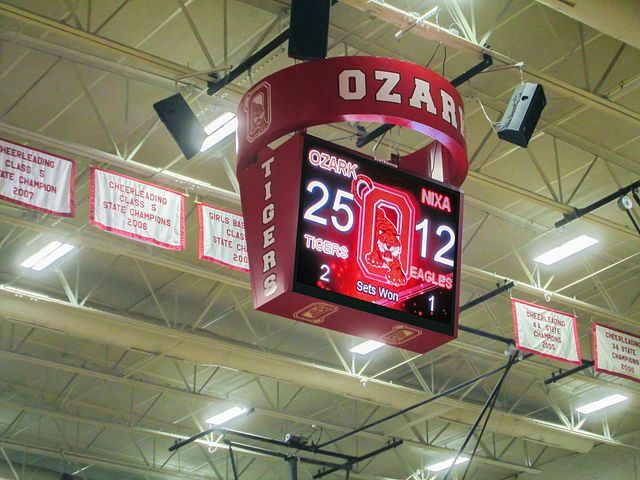 We thought it’d be good to get an outside take on the experience, so we chatted with Josh Smith, the activities director at Mary Institute and St. Louis Country Day School (MISD) to see what his experience has been like working with a Daktronics video board. Josh also commented that they use other facilities for their varsity programs, 29 in all, so it’s a good opportunity to promote additional events happening around school. It seems that the display meets approval all around; he’s had opponents come up to him and share their appreciation for seeing their school represented up on the big screen, as well. Ease of use, happiness of both sides of the field and a smart way to utilize shared space — sounds like a win to us.